Girl In A Wetsuit a photo by PiscesDreamer on Flickr. Even inanimate objects get into the Stanley Cup Spirit in Vangroover. bronzelife-sizeStanley ParkVancouver, British ColumbiaTo create the bronze statue, sculptor Elek Imredy first took a mold of the top surface of the rock. In his studio, he made a replica of the rock and modeled the figure in clay. A plaster of paris mold was made from the clay figure and the sculpture was cast in fibreglass. This fibreglass figure was flown to Rome where it was cast in bronze.On June 9th, 1972, the sculpture was set in place by a crane reaching out from shore to the rock 8o feet away and fastened to the stone with stainless steel bolts. The next day the sculpture was ceremoniously unveiled. Girl in a Wetsuit has become a landmark for visitors to Stanley Park and to boats that enter the harbour. 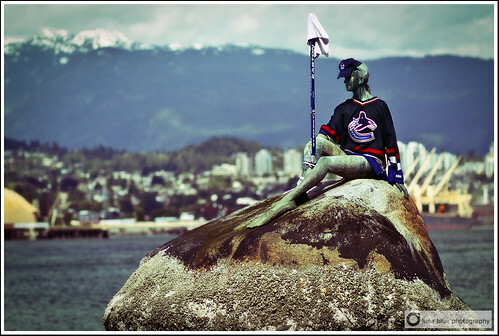 This entry was posted in Art, Culture, Sports, Vancouver. Bookmark the permalink. Man, Anthony Weiner would be ALL over that . . .
GAH! Thanks for that image. Now where did I put my mind’s eye bleach?